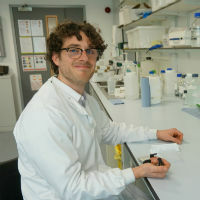 John Graham-Brown is a PhD student at the University’s Institute of Infection and Global Health. After graduating with an undergraduate degree in Veterinary Science at the University, he completed an MSc in Veterinary Parasitology at the Liverpool School of Tropical Medicine and worked as a vet in Wales, before returning to Liverpool for his PhD. 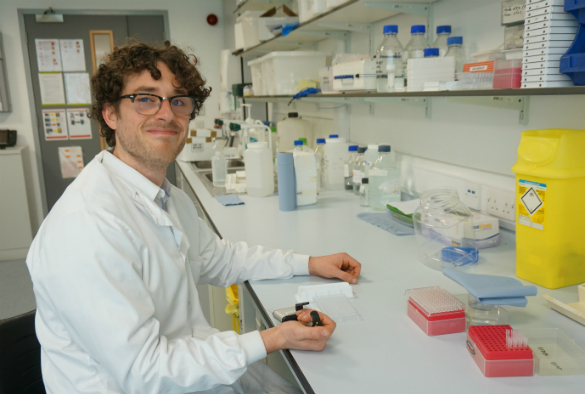 “My project is focused on a parasitic flatworm known as liver fluke, which impacts hugely on livestock welfare and productivity here in the UK. It forms part of a wider EU study aimed at developing vaccines against important parasites of both animals and people. As the name suggests, liver fluke (Fasciola hepatica) infect livers, where they cause extensive tissue damage and disease. In the UK, infection is common in sheep and cattle, while in other parts of the world people are also at risk. Treatment and control is heavily reliant on the use of a small number of available drugs. As a consequence of this and the high levels of infection present in the UK, drug resistance has started to emerge as a major issue meaning there is a need to develop new and alternative ways of controlling the parasite, such as vaccines. To help investigate this, we’ve been looking at the immune responses of cattle from commercial dairy farms which have become naturally infected with liver fluke. Our aim was to determine what sort of responses these animals had to infection and whether there was any evidence of a protective immunity, and if not, why not. From our findings we’ve been able to show that liver fluke intentionally alters the immune responses of cattle to a state which has no protective effect, thereby allowing the parasite to survive and reproduce within the animal for months, or even years. By identifying this mechanism of ‘immune-modulation’ in naturally infected cattle, we hope to better inform future work into vaccine development so that such effects can be avoided or even stopped – ultimately resulting in the production and availability of an effective vaccine against this important parasitic disease. I have really enjoyed doing this project, and am looking to continue with a career in research. I am now in the process of writing up my PhD and am lucky enough to have secured a position as a research associate at the Institute of Infection and Global Health in order to continue the liver fluke research our group is leading. I am also in the process of enrolling in a residency programme with the European Veterinary Parasitology College, which will be based within our Liverpool Veterinary Parasitology Diagnostics team. This will hopefully help to broaden my understanding and knowledge of veterinary parasitic diseases.